There’s a lot of annoying mendacity in Paul Ryan’s budget proposal, but the most annoying by far is his repeated insistence that under his plan seniors would get “the same kind of health-care program that members of Congress enjoy.” Aside from the fact that he’s offered no details about how or why private insurers would magically decide to provide the same kind of benefits to the elderly that they do to members of Congress, he’s just flatly lying about the most important part of his proposal: namely that it will force seniors to pay far, far more for Medicare than they do now — and far, far more than members of Congress pay for their health insurance. If you’re a millionaire, maybe this counts as the “same kind” anyway, but for the rest of us it doesn’t. 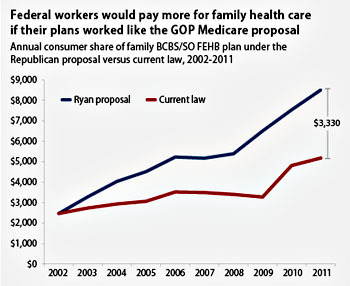 Here’s the difference: under Ryan’s plan, the government pays a set amount for Medicare and you pay for the rest. So far, that’s pretty similar to the congressional plan. But that set amount goes up very slowly under Ryan’s plan — much more slowly than the actual rise in the cost of health insurance — which means that seniors have to pay a bigger and bigger share of the total premium cost as the years go by. CAP’s Tony Carrk and Nicole Cafarella ran the numbers to see how that would have worked out if Ryan’s formula had applied to Congress over the past decade, and the dismal results are on the right, below. Under the actual congressional plan, family premiums have gone up from $2,500 to $5,000. Under Ryan’s plan, premiums would have gone up to about $8,300. That’s a difference of $3,300 in only ten years. Over the course of 30 years, the difference would be more like $10-15,000. That’s a pretty whopping difference, and it would be even bigger for Medicare beneficiaries since Medicare starts from a bigger base. The result is that lots of seniors just flatly wouldn’t be able to afford to buy Medicare. They wouldn’t have enough money to pay their share of the premium, and that means they’d be uninsured and uncovered. Ryan has, of course, offered up a bunch of handwaving about how indigent seniors would get bigger subsidies, but unsurprisingly has been pretty sparing with any details. If he explained things, after all, everyone would immediately figure out (a) just how miserly his plan is, and (b) how much it would actually cost to support all those seniors who couldn’t afford the astronomical premiums his plan forces on them. The end result of all this is debatable. What’s not debatable, however, is whether his plan is “the same kind of health-care program that members of Congress enjoy.” It’s not. It’s not even close.